Too strange that this is the last regular SUYB link-up of 2017. I managed to link up with every single one this year! Thanks so much for hosting, Steph & Jana! Next year I’m revamping my book review outline and images, but for now let’s get to it. This month I finished 3 books and two of them were duds. Summary: As she sets off to complete the first solo female flight from east to west (London to NY), Beryl Markham looks back on her life and the people and places that shaped the woman she’s become. | Why I Read It: Originally I picked it for Erin’s challenge categories. | What I Thought: When I started this book I was trying to read it alongside West With the Night. That was a mistake. Once I abandoned the autobiography, I started to enjoy this novel. As is the case with many hist-fic books, there were lulls and slow moments. I liked McLain’s descriptions of Africa, though. I think the county was a HUGE part of who Markham was and the descriptions of the country helped to further define this remarkable, wild, fearless woman. Man, she had it rough… She brought on some of her hardships, but others were dealt to her and she survived out of shear will and necessity. I didn’t envy Beryl for even a second, but I admired her throughout the whole book. I’m also interested in picking up West With the Night again. I’m curious what stories the real Markham shared with readers. You should read it because… you enjoy historical fiction and being transported to a new world and era while riding co-pilot to a fierce, independent, flawed woman. Summary: Nicola Ferris planned to meet her cousin Frances on the remote Grecian island of Crete, escaping touristy crowds, stress, and drama. Unfortunately, before even stepping foot in Agios Georgios, Nicola is swept up in a web of murder, thievery, and danger. | Why I Read It: I picked it as my Disney book in Erin’s last challenge. | What I Thought: Considering it has +4★s on Goodreads, I am clearly in the minority here. The book was a fun story, but it was a lot to get through and it took coaxing to keep picking it up. It’s actually more like a 2.5 rating for me. I enjoyed the descriptions of Greece and I liked the banter between characters, but everything felt too simple and straight forward. Maybe because it’s a romantic thriller written in 1962? Folks on GR seemed to enjoy the movie so I guess I’ll give it a shot now that I’ve read the book. You should read it because… you’re in the mood for a dated thriller with likeable characters and a Disney-esque ending. Summary: No one is born bad, right? Even Snow White’s evil stepmother had a story to be told. | Why I Read It: I found it on Kindle Unlimited and figured why not. | What I Thought: This book is more of a 1.5 stars but I rounded up 🙄 Honestly, the story itself isn’t bad. Nothing groundbreaking, especially with all the fairy tale rewrites and TV shows (like OUAT), but it was an entertaining story. It’s the writing that’s just so. freaking. terrible. It’s sweetly awkward and juvenile and simple. Sometimes simple is great, but not in that combination. The book is too dark for elementary age/middle school kids (IMO), but the writing feels SO young. I don’t know. I have no idea what age level this book is considered. Also, I think these books are released/claimed by/associated with Disney? I can’t believe they’d be ok with this. I won’t lie- I rolled my eyes every other page and totally should’ve quit this book. You should read this because… just… don’t. There are waaay better fairy tale books out there to suit your taste. At the end of the month I’ll link up again with Steph and Jana for an annual review 🙂 And on January 1st Erin’s next challenge starts (see my picks on Thursday!). 2018 feels like it’s going to be a good year for books! What’d you read this month? I hate it when books just aren’t quite good! Sorry Fairest of Them All wasn’t good – I was curious about those. I really, really wish it’d been better. I feel like these fairy tale books are mostly let downs for what I build up in my head so I tend to stay away from them lol. Did you ever watch Grimm? Yeah, I completely agree with you. The Lunar Chronicles killed it, but nothing’s compared since then. I haven’t seen Grimm. It looked kind of violent when it was on TV, but maybe I’ll look into it if you think I should! Once Upon A Time has fallen flat in recent seasons, but I need to catch up on that show, too. Hurrah for linking up every month! I adored Circling the Sun. I never like books when I am reading another, which is why I only read one at a time! I felt like Circling the Sun was a great adventure. I wish I hadn’t spoiled it in the beginning with the autobiography. Typically I read two to five books at a time, but they’re allll different and unrelated. I messed up with how similar these were. That’s so sad about fairest of all!! I’ve seen all of those books around and wanted to read them! Ughhh- I *really* wanted to like it! I know there are 2 or 3 others but I won’t be reading them. Total bummer. I love the movie The Moonspinners – I didn’t even know it was a book! Pretty sure we’ve discussed Beryl Markham several times and you know I agree about both books! Hmmm… I will definitely have to check out the movie then. I’m pretty sure Circling the Sun came across my radar from you! Lol! 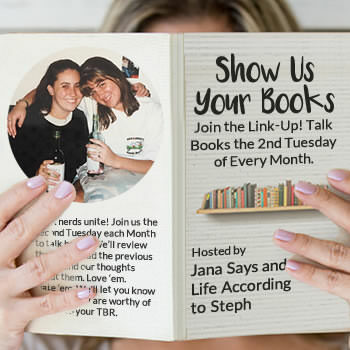 I was bummed that I didn’t read anything this month to linkup with Steph and Jana! I keep on seeing Circling The Sun around and it sounds like it’s a good read! I’m adding it to my list! I can’t wait to see what’s on your list for Erin’s challenge! I really enjoyed Paula McLain’s other book, The Paris Wife, that was a nice book. It set me up to read The Sun Also Rises. I’ve considered picking up another book by McLain. Maybe I’ll add that one to my list, too! I will read two books at a time but they have to be unrelated. Yeah, I usually don’t mind reading multiple books, but these two were just too similar. In response to your return comment on your blog: I hate violence in movies and TV, but it doesn’t bother me in books. Haha. Couldn’t tell ya why. Ugh. I hate it when books underwhelm, especially when you have such hopes for them. I normally cannot read two books at once. I get confused. 😀 The only time I even attempt two books is if one is non-fiction. I’m looking forward to seeing everyone’s best of lists and seeing what books I somehow forgot to add to my TBR! Honestly, I usually read two to five books at a time although I try to cap it at 4. I just finished one last night and I’m in the middle of two others right now. I just need all the books to be very different. That’s where I messed up with Markham’s stories. Quick pause here: HOW IS THIS VOLUME 10. You have read so many books and I’m so. frekaing. impressed. I was curious about the fairest of them all! I actually think I saw it in a Disney gift shop?? Maybe that was another similar book. It’s a shame because it’s a cute premise! You probably did see it in a Disney Gift Shop! I think it’s licensed or sold by them. Blehhh- it just fell SO flat for me! I hate when I end up with a bad reading month. I usually read two books at a time, but either one is fiction and one non-fiction or one an adult book and one a YA book. I like to keep two or three books going at once. I was a little “meh” on Circling the Sun. I didn’t really love West With the Night, though, either. Circling the Sun definitely wasn’t my favorite historical fiction novel, but I enjoyed it for what it was, especially after I ditched West With the Night. Circling the Sun is on my list! I absolutely hate when books that should be good, just, are not! It always puts me in a book funk. I knew from the 3rd chapter that Fairest of All was going to be a dud. I have NO idea why I stuck with it. Ughhh! oooh can’t wait to see your new pictures and whatnot for the fancy new year. you really did not have the best luck with these books! i love love love fairytale retellings but there are soooo many bad ones out there, it’s not fun. i’ll be skipping that one for sure. I love the cover! (I have it on Kindle but I saw it on GoodReads.) I really wish it’d been better. Ugh. Oh man! Now that I am watching Once Upon a Time I was interested in reading Fariest of All…. thanks for saving me the trouble! Good job linking up every month! I tried, but don’t even know if I did it six times. Oops! Haha! I am usually reading one book and listening to another at the same time, but it has to be a non-fiction and a fiction. I thought I skipped a month but when I went back to look it said 12 volumes. I surprised myself! Haha! I read 2 to 4 books at a time and don’t usually have an issue, but West With the Night and Circling the Sun were just too similar. It was burning me out.